At midday, King’s Parade was awash with a sea of blue-clad schoolchildren protesting rising sea levels and flooding as a result of climate change. The bells of Great St Mary’s church signalled the start of the lie-in, prompting protestors to lie on the ground for a total of eleven minutes, creating a visual representation of a flood. 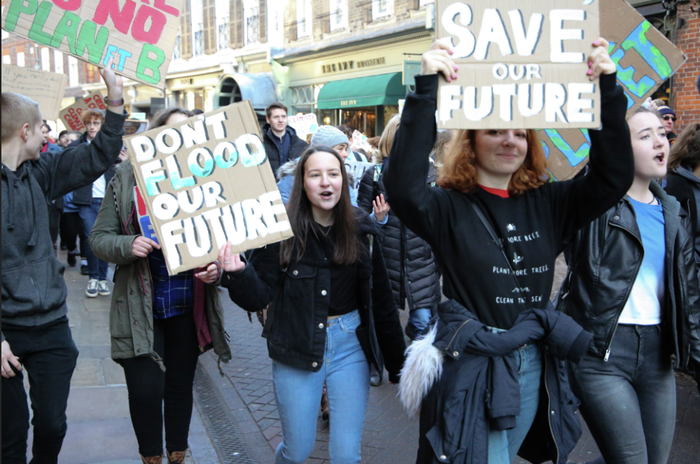 Organised by Cambridge Schools Eco-Council, the protest was part of the third consecutive monthly UK-wide strikes by school children, coordinated by environmental advocacy group YouthStrike4Climate. Similar protests have been taking place around the world. The last protest on Tuesday 15th March saw an estimated 1.4 million people taking part, with students walking out of schools in 2,233 cities and towns in 128 countries. The global strikes were prompted by the activism of Greta Thunberg, a sixteen year old Swedish student who has spent every Friday since last August camped outside Swedish parliament in protest of climate change. UK schoolchildren are calling for a general mobilisation during the next Global Strike for Future on the 24th of May. Following the teach-in, at 11am the protestors marched down Castle Hill and Trinity Parade before arriving at King’s Parade. Protestors gave speeches, demanding that local authorities and government declare a climate emergency. The students promised to continue the Youth Strikes until their demands are acted on, and called on the public to join the next 24th of May Global Strike for Future. The protest took the theme of flooding and sea level rise just a month after Cyclone Idai swept through Mozambique and Zimbabwe. A UN official said the cyclone may prove to be one of the worst weather-related disasters ever in the Southern Hemisphere. The student protesters today stressed that those least responsible for climate change are suffering the most from it, with communities in the Global South already being disportionately impacted today.